The ACT Health Directorate is responsible for the stewardship of the health system in the ACT. They set the strategic direction to ensure health services meet community needs and expectations. Their aim is to deliver improved health outcomes in a system that is innovative, effective and sustainable now and into the future. The ACT Health website includes service and health centre information for people living in the ACT and surrounding region. In 2018, ACT Health identified the need to rebuild their web and intranet sites to align with audience needs and improve the user experience. contentgroup was engaged as part of the overarching project to improve these channels by editing and updating written content. Prior to our work commencing, ACT Health ran a content audit to identify duplication and inconsistencies in their website content. The audit reviewed over 1300 pages of content, determining those that could be kept, removed or merged. Our responsibility was to rewrite the remaining content in line with their information architecture, internal and government style guides, accessibility standards and audience personas. We ensured all content was written in plain English and had a consistent tone of voice. The final number of pages delivered was 437. 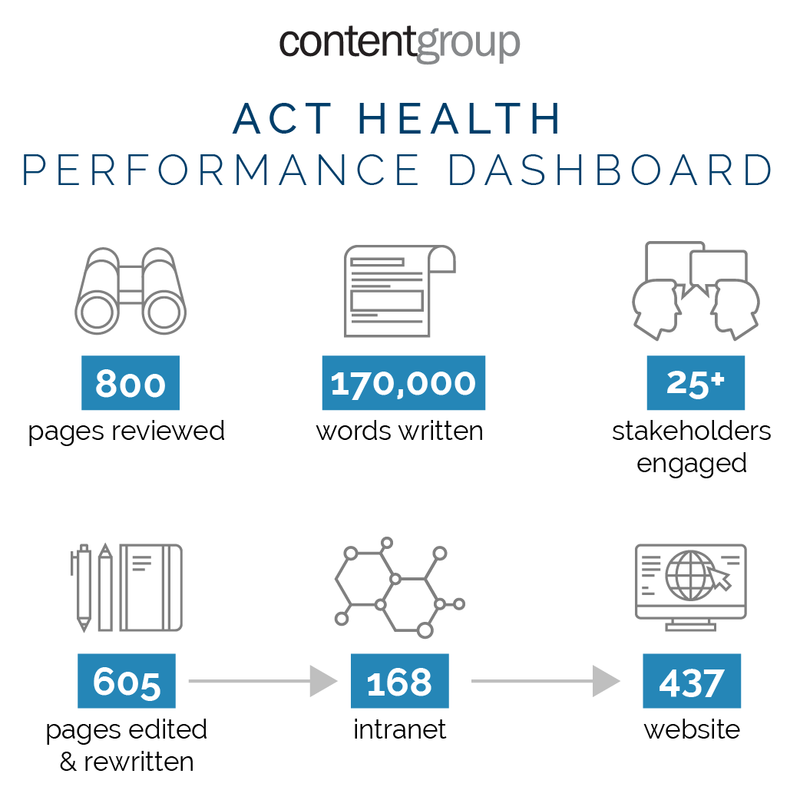 In addition, we conducted a content audit of ACT Health’s intranet, reviewing over 270 pages of content. Following style guides and standards, we rewrote the content in plain English to deliver 168 pages. We used a model of working that allowed us to be based on site at ACT Health. This helped us immerse ourselves with the project team and provided direct access to key stakeholders. We assisted ACT Health with the overarching strategic communication and stakeholder engagement activities through staff information sessions. We also conducted regular meetings with key business areas to manage relationships and expectations and resolve any content issues. The intranet went live on 31 July 2018, receiving positive feedback from staff across ACT Health and Canberra Hospital and Health Services. Similarly, the website was relaunched on 1 October 2018. Anecdotal feedback shows content is easier to read and understand, with redesigned navigation making it simpler to find information. We also created an ACT Health content style guide and governance guide to ensure future content development remains consistent.